Current: What is Five Forces Analysis? Knowing the strength of these five forces, you can develop strategies that help their businesses be more competitive and profitable. Looking at opportunities, you can to strengthen their organization's position compared to the other players for reducing the competitive pressure as well as generate competitive advantage. What are the substitute products? Is it difficult to enter this industry? Who are the major competitors in this industry? Is the state of competition in the industry stronger than "normal"? Can companies in this industry expect to earn decent profits in light of the competitive forces? Are the competitive forces sufficiently powerful enough to undermine industry profitability? The market is conquered by a few big suppliers. There are no alternative products available. The supplier customer base is fragmented, making their bargaining power low. High switching costs from one to another supplier. Possibility of supplier integration forward, to obtain higher profits and margins. The supplying industry consists of several small operators. The supplying industry is controlled with high fixed costs. The product has substitutes. Switching products is easy and simple. Switching products does not incur high costs. Customers are price responsive. Customers could manufacture the product themselves. Cost advantage of existing players. Intellectual property like licenses, etc. Access to raw materials is controlled by existing players. Distribution means are controlled by existing players. Existing players have secure customer relations. Elevated switching costs for customers. The relative price for performance of substitutes. Players are the same size. Little or no differentiation between players and their products leading to price competition. Barriers for exit are high. These forces can be neatly brought together in a diagram like the one below. Why do you buy Nike over Adidas? The answer lies in the term competitive advantage. Competitive advantage is a set of unique features of a company and its products that are perceived by the target market as significant and superior to the competition. It is the reason behind brand loyalty, and why you prefer one product or service over another. There are three different types of competitive advantages that companies can actually use. They are price, product differentiation, and cost. Price is one of the most influential factors that can affect the company's profit. Companies can take advantage by reducing and increasing the price of the product, but it is generally taken to have short term benefits. Because in long term, many other factors like quality, substitutes also impacts. "When a product or service has a valuable, unique offering for their customer"
In economics and marketing, product differentiation (or simply differentiation) is the process of distinguishing a product or service from others, to make it more attractive to a particular target market. Generally an industry with high rivalry or moderate rivalry will have the homogeneous kind of product. Difference in the company's product could not be seen. So, to gain an advantage, a company may differentiate its product from that of the competitor. It will help them gaining an advantage. Product cost is also a factor which decides the overall profitability of the organization. If the cost of the product is higher than the competitor's product, then the profit earned by the company will be less. To take an advantage, firm may try to reduce the cost and employ effective techniques of production, so that the firm's profit will increase. NiceWare is a leading Footwear company that operates in the athletic apparel industry. 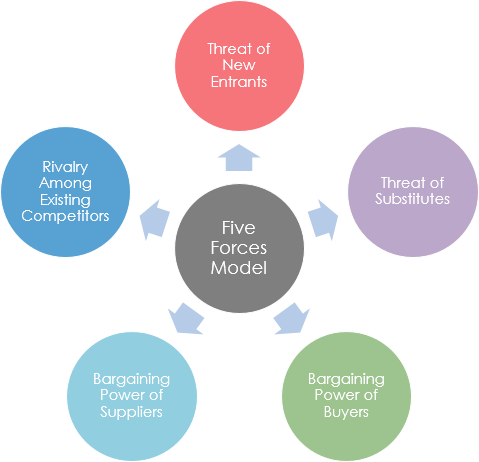 Based on Porter's Five Forces model the threat of new entrants is moderate as there are high capital costs, mostly related to advertising and promotion, especially when a new product line is launched. On the other hand, company A can expand in the performance apparel industry and cross-sell its products. The bargaining power of suppliers is relatively low because the company has many different suppliers both in the US and abroad. The bargaining power of customers is higher in the wholesale customers as they can switch at a low cost to the competition, thereby gaining a higher margin. With respect to the retail customers, the bargaining power is lower as customers are loyal to the brand. The threat of new entrants is high as the entry barriers are low - low R & D expense, not much specialized knowledge is required in operating the business, low production and labour cost in some cities. The threat of substitute products is relatively low because brand loyalty is high. Hence, the demand for the company's products is expected to continue in the long-term. The competitive rivalry in the industry is high as there are a lot of well-established companies with significantly larger resources and process patents. The figure below shows another Five Forces Analysis diagram example for a vacuum cleaner company. An industry is unattractive when all five forces are producing strong competitive pressure. This causes industry profitability to be at unacceptably low levels, which causes many businesses in the industry to frequently operate at a loss and forcing some to go out of business. An industry can also face intense competitive pressure when just one or two critical competitive forces have the ability to hinder profitability. 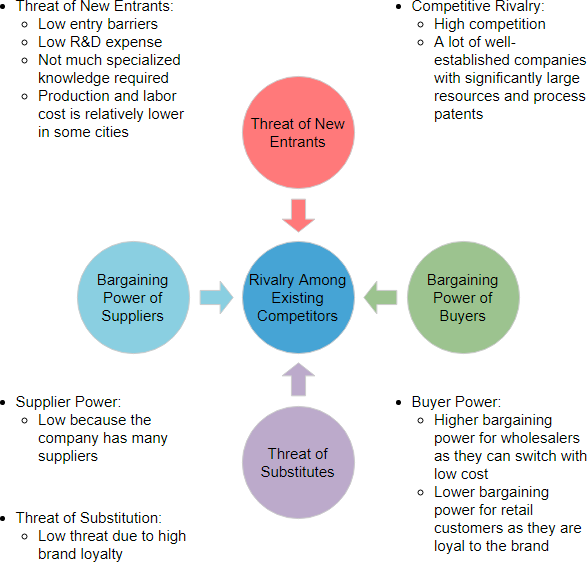 Porter's Five Forces not only can help assess the intensity of competition, but it also helps with strategic thinking on how to better match a business' strategy to the specific competitive character of the marketplace. 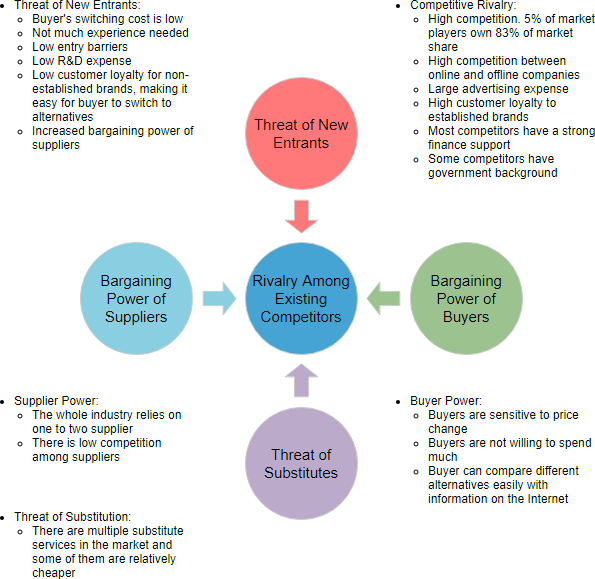 The ideal competitive environment for earning superior profits is when both suppliers and customers have weak bargaining power, there are few or no good substitutes, there are high barriers to enter the industry, and rivalry among present sellers is minimal. * Five Forces Analysis is powered by Visual Paradigm's web technology. You can create it in both Visual Paradigm Desktop and Visual Paradigm Online.